Filters are mostly utilized in the production of active pharmaceutical ingredients (API) which are small molecule drugs. Variety of oral dosage products i.e. mouthwash, cough and intestinal medicine, in order to maintain the biological stability use pharmaceutical filters. Particulate filtration in the 1 to 10 micron range is usually sufficient. Goldstein Research analyst forecast the Pharmaceutical Filtration Market size is set to reach USD 22.5 billion by 2024, at a CAGR of 11.1% over the forecast years. The report covers the present ground scenario and the future growth prospects of the Pharmaceutical Filtration Market for 2016-2024 along with the statistics of filters used in various verticals. We calculated the market size and revenue share on the basis of revenue generated and sales of various categories of Pharmaceutical Filtration from major players across the globe. On the basis of technique, microfiltration is mostly used and the fastest growing among others due to its implementation in the manufacturing of generic and biopharmaceuticals drugs. While MCE membrane filters accounted for largest revenue-grossing among all the filters due to its unique and advanced characteristics that are successfully implied on production, research and environmental testing in pharmaceutical industry. Pharmaceutical Filtration Market Outlook 2016-2024, has been prepared based on an in-depth market analysis from industry experts. 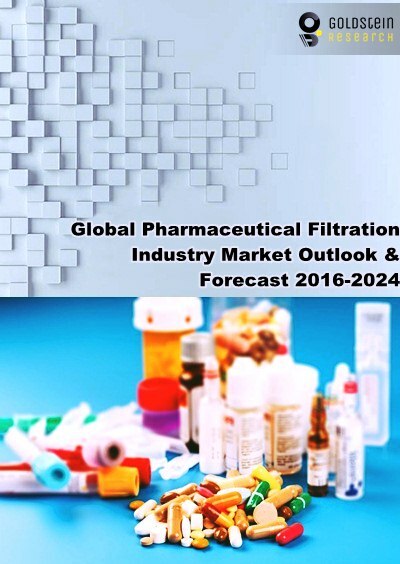 The report covers the competitive landscape and current position of major players in the global Pharmaceutical Filtration market. The report also includes porter’s five force model, SWOT analysis, company profiling, business strategies of market players and their business models. Global market report also recognizes value chain analysis to understand the cost differentiation to provide competitive advantage to the existing and new entry players. Our global Pharmaceutical Filtration market report comprises of the following companies as the key players in the Pharmaceutical Filtration market: Eaton Corporation Plc; GE Healthcare, Parker Hannifin Corporation; Merck KGaA; Danaher Corporation, 3M; Amazon Filters Ltd.; Sartorius Stedim Biotech S.A.; Graver Technologies, LLC; and Meissner Filtration Products, Pall Corporation. According to the report, major driving factor for Pharmaceutical Filtration market is dependent upon the opportunity in biopharmaceuticals which is big and growing too rapidly, simultaneously efficacy and safety of biopharmaceutical products is driving the pharmaceutical filtration market. Today, biopharmaceuticals generate global revenues of USD 163 billion, making up about 20% of the pharma market. It’s by far the fastest-growing part of the industry with CAGR of 8% for the foreseeable future. Further, the report states that the major challenge is the seismic shift because of changing overall healthcare requirements, majorly supported by regulatory reforms, expiring patents and entrance of new companies in the sector. Based on geography, North America is the leading regional sector with 44% of global pharmaceutical filtration market due to increasing number of pharmaceutical, biopharmaceutical, and biotechnology companies in this region. APAC is the fastest growing market due to escalating presence of drug manufacturers in the developing countries such as China and India while stringent regulatory guidelines to provide safe drugs is encouraging the use of pharmaceutical filtration products in Europe. What is the revenue of Pharmaceutical Filtration in 2015-16 and what would be the expected demand over the forecast period?